Ghananie.Com: I'm Not Dead,....... I'm Alive! 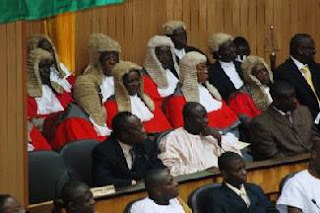 POOR RECORD keeping within Ghana's judiciary was made manifest yesterday when a Tarkwa-based magistrate was declared 'dead' by the President of the Association of Magistrates and Judges of Ghana (AMJG), Mr. Justice Joseph Bawah Akamba. The incident took place at the 28th Annual General Meeting (AGM) of the AMJG in Accra.Justice Akamba mentioned the name of Mr. Kwame Gyamfi Osei, a magistrate at Tarkwa, who was present at the meeting, among members of the association who died in the course of the year.He therefore called for a minute's silence to be observed in their memory.Apparently shocked by the pronouncement, colleagues who were sitting by the virile and healthy-looking magistrate shouted, "He is here. He is here", while he himself rose energetically declaring, "I am here, I am alive", amidst rib-bursting laughter from all present, including Chief Justice Mrs. Georgina Theodora Wood.After the spontaneous laughter, president of the association resumed his speech by apologizing profusely to Mr. Osei for declaring him dead when he is alive.Mr. Justice Akamba then deplored the poor record keeping within the judiciary which had made him commit that unusual blunder. "Record keeping in the service is so appalling and I'm glad it has happened this way. This is a true reflection of the sentiments on the ground. I am very sorry. "He narrated how difficult it was for him to get the right records from judges and magistrates to prepare his speech.The AMJG President, who used the occasion to congratulate the Chief Justice on her appointment, asked her to work with members of the association as she could not do the work alone. To members of the association, he said, “All should be on board because when we share the same vision and direction, we get to our destination quicker.”According to Justice Akamba, the judiciary had performed creditably despite the numerous challenges it faced. Though the conditions of service of members had improved remarkably in recent times, he called for further improvement to meet the rising cost of living.He asked members to practise “true internal justice” within the judiciary “so that it doesn’t only seem that we only dispense justice and democracy but practise it as well”. Justice Akamba advised his colleagues, saying, “Let’s do away with archaic procedures” which caused undue delays in justice delivery.For her part, Mrs. Wood promised the judges and magistrates that the reforms started by her predecessor, the late Justice George Kingsley Acquah, would continue despite the challenges faced by the service.She promised the judiciary that there would be frequent refresher courses for members to be conversant with modern trends, and warned that those who failed to attend the courses would be sanctioned appropriately.“Foreign trips and courses will not become the preserve of a select few including my own self,” she added. The Chief Justice encouraged magistrates and judges to use Alternative Dispute Resolution (ADR) methods to clear the backlog of cases, adding that the system would enable them to deal expeditiously with criminal cases.She thanked her colleagues for their support and goodwill since she assumed office, and expressed the hope that they would work assiduously as they had always done.A Supreme Court judge, Mrs. Justice Sophia O.A. Adinyira, who chaired the meeting, called on her colleagues to ensure that all in society had access to justice.“We as the custodians and enforcers of the Constitution need to constantly remind ourselves that the achievement of the concept of access to justice depends heavily on the way and manner we administer justice. “Despite the financial and infrastructural inadequacies that are facing the Judicial Service, we as judges and magistrates must continue to dedicate ourselves to building a truly independent, competent, efficient, and an effective judicial system.”Dr. Alfred Doku of the Korle-Bu Teaching Hospital Cardiothoracic Centre took the justice dispensers through a series of prevalent diseases and ways to prevent them.Twelve retired members of the association were honoured.